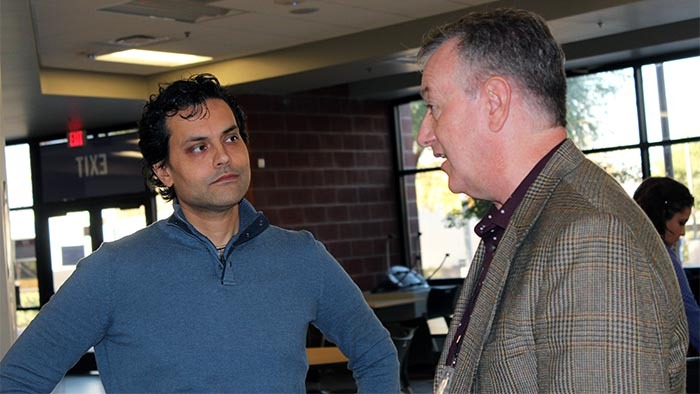 Ravi Hutheesing (left), former guitarist for the band Hanson, visits with Thomas Fletcher, Principal of Ronald Reagan Fundamental School in Yuma, Ariz., on the GCU campus. Hutheesing spoke to 50 students from the Crane Elementary School District, which won the “Be the Change” video contest. The contest prize was a trip to GCU, lunch, a talk by Hutheesing and a campus tour. School should be all about reading, writing, ’rithmetic. About pens and books. Apples for the teacher. Hallowed hallways. But Principal Thomas Fletcher of Ronald Reagan Fundamental School in Yuma knows better. Too often, those hallowed hallways are where he sees the pain, hardships and struggles students carry, like burdensome backpacks heavy with the weight of the world. 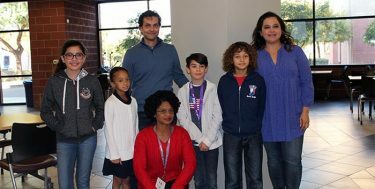 Fifty of those students, mostly fourth- through sixth-graders from the Crane Elementary School District, which includes Ronald Reagan Elementary, headed to Grand Canyon University recently for winning the “Be the Change” video contest, organized by the Arizona School Boards Association. The visit to GCU included a lunch, a talk by former Hanson guitarist Ravi Hutheesing – keynote speaker at the association’s conference that day at the Arizona Biltmore – and a campus tour. GCU sponsored the talk by the keynote speaker. The video spotlights all the ways the students have been the change in Yuma over the past two years, despite their own challenges. Fletcher said their giving spirit was sparked after the district received a 21st Century ConnectED Grant from Apple. In 2014, Apple chose 114 schools to receive a part of $100 million in grants. The grants were given in connection with the White House’s ConnectED Initiative to improve technology in schools and increase broadband access from 30 percent to 99 percent. Nine of the district’s schools were included in the grant, in which every student received an iPad Air 2 and every instructor received a MacBook Air and iPad Mini, along with Apple TVs for every classroom, wireless infrastructure and professional development. The students have taken on various community projects over the past couple of years, including helping to make shoes for children in Uganda and spreading the message of kindness through the nonprofit Ben’s Bells. The nonprofit organization provides shoes for Ugandan children. A big health problem there is caused by a sub-Saharan sand flea called a jigger. The female jigger can burrow into the foot and lay eggs, the resulting infestation causing severe inflammation and in some cases, sepsis, amputation of digits and even death. Sole Hope’s goal is to provide shoes to try to stave off the health problem. Those denim cutouts were sent to Africa, where Ugandan men and women earn a fair wage by making the shoes from the denim cutouts and also from old tires, which are used to form the shoes’ soles. The school reached a goal of providing cutouts for 600 shoes. Beyond Sole Hope, Fletcher felt the compassion of his students when he himself got sick two years ago. “I had this outpouring from the community,” he said, and the district wanted to keep that kindness momentum going. This year, the students are involved in the Ben’s Bells Project. Ben’s Bells is a nonprofit founded by Jeannette Mare after the death of her 2-year-old son, Ben. She and her family began painting and creating wind chimes to help deal with their loss. At Ben’s Bells studios – two are in Tuscon and the Phoenix location is at 417 E. Roosevelt St. – volunteers make wind chimes with a signature bell on the bottom. They are hung in public places for people to find and take home. Included with the chime is a note that emphasizes the importance of kindness and encourages the finder of the bell to be kind. Fletcher said his campus wants to be a “kindness school” and continues to live that ideal of being the change in the world. Event speaker Ravi Hutheesing told students how he has tried to be the change and also spoke about the many changes in his own life. Hutheesing (third from left) told students to not be afraid to get out of their comfort zone. He told students about getting his first guitar, organizing his first band in junior high school, teaching guitar at a local guitar store as a teen and taking the initiative to get on the train and go into Manhattan, where he knocked on the doors of recording studios and asked to sit in so he could learn from the professionals. He was still in high school when he built his own music studio in his mother’s basement. “The reason why this worked for me and the reason so many other things have happened for me is the same reason why things can work for you. You just have to step out of your comfort zone throughout your life,” he said. Hutheesing became the guitar player for the band Hanson, best known for its No. 1 hit “MMMBop,” thanks to one of the people who used his recording studio. The musician emphasized the importance of making connections with people. “One of our biggest fans convinced her parents to invite us to play their Christmas party. Her parents were Bill and Hillary Clinton,” he said. But then the record industry collapsed and Hutheesing found himself without a job. That’s when he stepped out of his comfort zone and created another opportunity for himself – this time as a music journalist. He started calling magazines to tell his story in the industry, and they encouraged him to write that story himself. He also wrote a book and landed sponsorships from guitar companies. “Then in 2008, it all went away. The economy collapsed. I didn’t have any money anymore. I didn’t have any contracts,” he said. Undaunted, he changed gears again and became a pilot. He always had wanted to fly an airplane, and he traded guitar lessons for flying lessons with a pilot his wife happened to meet. He also created a folding guitar for pilots called the Raviator. Hutheesing, who developed vertigo, no longer pilots planes. That meant stepping out of his comfort zone again and doing what he does now, which is serving as a cultural diplomat for the U.S. Department of State. He created a songwriting camp, bringing together musicians from different countries and cultural and religious backgrounds to bridge those divides – his way of being the change in the world. Fletcher said his school district was shocked to have won the “Be the Change” video contest, though he was not shocked that his students have done such good things for their fellow man. 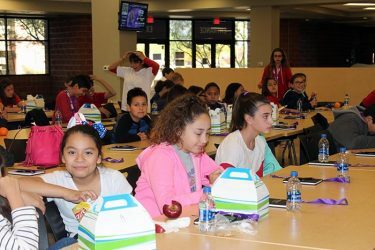 He wondered how many of the elementary students on the GCU campus that day were on a college campus for the first time, learning about how higher education can be a vehicle of change in their own futures. Fifth-grader Sophia Daou was looking forward to one thing on her tour, and that was to visit anything related to nursing. Her father is a nurse. The students may be children of poverty with not much to give. But no one doubts they’re rich in kindness and ready to be the change. You can reach GCU senior writer Lana Sweeten-Shults at (602) 639-7901 or at lana.sweeten-shults@gcu.edu. Follow her on Twitter @LanaSweetenShul.